The dramatic Birdcage 75th by Pininfarina is set to be the star of Passione Engadina, the international gathering of Italian historic cars taking place in St. Moritz from August 24 to 26. The award-winning concept supercar, that after seven years since its launch still retains its power to impression, will be on display all weekend in the main square of the famous Swiss tourist resort. 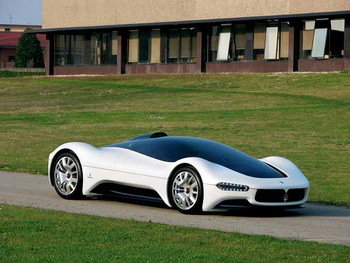 With the Birdcage 75th, based on Maserati heritage and the mechanicals of the MC12 and realised in collaboration with Motorola, Pininfarina revived the theme of the true dream car but now proposed in a synthesis of the vision of the three companies: exclusive design, sports DNA and technological innovation. Pininfarina’s prosperous collaboration with Maserati, marked by the great international success of the Pininfarina-designed Quattroporte, GranTurismo and GranCabrio, is celebrated with this rolling hi-tech sculpture that evokes a new future context, imaginary but possible, while simultaneously paying homage to the strong and distinctive brand characteristics of the Tridente. Presented in 2005 to celebrate the 75th anniversary of Pininfarina, the Birdcage 75th is a concept of a road car where everything – style, performance, use and conception of the car – is extreme so as to get the maximum impact on the collective imagination. Based on the road racing chassis of the Maserati MC12, it seeks to capture the ultimate expression of speed, sensuality and elegance – to create a functional and dynamic automotive sculpture. Integrating some Motorola technologies make the 'Seamless Mobility' vision real, or the fluidity of the technologies as a subsequent stage of the internet revolution.